Is Cheap Ammo Bad For Your Gun? For handgunners who want to improve their shooting, there are low-cost or even no-cost approaches, but nothing beats proper practice with real ammo. While this ammo looks bright and clean and proved to be reliable, un­for­tunately it clocked 1,489 fps out of a five-inch 1911--way too hot. 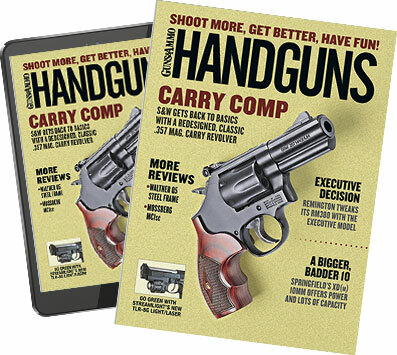 For handgunners who want to improve their shooting, there are low-cost or even no-cost approaches, but nothing beats proper practice with real ammo. However, ammo costs money. The usual cost-saving approach that many will suggest is to reload, but not all shooters reload or even want to. And then there's the surplus route. As a result of the current demand for ammo, and the sensitivity to price, there is ammo pouring into the country from places you may not have heard from. In some instances, you may have to consult the index in an atlas--and even then still not find it. The big attraction of surplus is price. When you shop, keep Mom's advice firmly in mind: "If it seems like too good a deal, it probably is." You see, we tend to think of surplus as "leftover military ammo," what was left over after the last war. Now, when we were kids (or at least the older among us) that was true. I have a book on the shelf, Bullets by the Billion, that describes ammo production in World War II. One ammo plant it mentions would see a mile-long, fully laden train leave the plant, loaded with .50 BMG ammo. Each week. When I was starting to shoot IPSC, you could still score piles of ammo, ammo that had been loaded for "the war" (whichever one) and was cheap. Well, those days are gone. What is "surplus" now falls into a few new categories: contract overruns; "commodity" ammo; and a government making some cash by cleaning out old warehouses. The contract overrun ammo is simply regular ammo but planned as "surplus." A foreign ammo plant gets a contract for, let's say, a million rounds. It goes to the commodities markets and buys, at lowest possible cost, the metals and powder it needs to make 1.5 million rounds. The plant loads the ammo and ships to the buyer, then boxes up the setup ammo, the extras and whatever else is lying around as "surplus" and sells it to us. The company makes more on the "surplus" than it made on the contract, and everyone is happy. What you don't know is how much of this ammo is return ammo, ammo sent back because it failed quality control inspections. The "commodity" ammo is what the plant makes day in, day out, all the time. One example would be 124-grain FMJ 9mm Luger ammo. You can always sell that, and so you always make it. And because you always sell it, the line is always set up to make it, and thus there are no recurring setup costs for each new caliber/load. For the ammo plant, life is good: Make it, ship it, bill the wholesaler and be happy. The last category is kleptocracy or lax government oversight that results in the production of low-quality, even unsafe ammunition. Back when I was learning about all this, I bought a bunch (luckily not too much) of 9mm ammo that was asserted to be "Egyptian surplus." Since no one I knew could read the Arabic on the boxes and headstamps, we didn't know. If you can't tell country of origin or haven't heard of the maker or the arsenal that produced the ammo, it's often wise to steer clear. What we found was that this was ammo of the most awful sort. First of all, it came in little pasteboard boxes. Wherever it had been stored, it had been there a long time and had not been well-treated. The small pieces of tape that fashioned the boxes were all dry and out of sticky, and the boxes fell apart in our hands. The stuff was horribly over-pressure and pierced primers on a regular basis. Plus it was nearly the most corrosive ammo I had ever encountered. (The crown for most corrosive ammo I've ever seen was French .45 ACP loaded in 20-round pasteboard boxes and would rust guns owned by the guy next to you at the firing range.) I got rid of the Egyptian (and French) ammo simply by shooting the few hundred rounds of each I had on hand. There was a time when the gun shows were awash in "Chinese" 9mm ammo. This was bright, clean, went bang and wasn't too terribly corrosive. And best of all, it was boxer-primed, so we could reload it. Well, we could reload it two or three times, and that was it. The cases were so soft that they'd have blown primer pockets after the third reload, and that was with mild loads. Load it up to +P, and the brass was good for one loading. I was stuck on this one. I had bought a few boxes, shot it, liked it and even reloaded some to check. Based on that quick "test," I bought a stack of cases of it as high as your arm. When I found out what it was like, I had to get rid of it. At the time I was with a local sheriff's office, so I burned the ammo in various submachine-gun courses and left the brass where it fell. The final indignity came from "surplus" ammo of a different sort. This stuff looked to be reloads, and when it demonstrated an embarrassingly large number of malfunctions, I looked into it. It had been surplus ammo in its country of origin. To get it imported, the importer pulled the bullets, dumped the powder, and imported the cases, bullets and powder as "components" and then reloaded it here. Except, the "reloading" standards were so slipshod that velocities were all over the place, cases were misshapen, and you could see that bullets were not standing straight in some cases. So what can we learn from all this--besides the fact that I'm a real ammo hog and sometimes a slow learner? First, check the price. Before the ammo price increase, the state I was teaching in had a "state bid price" (the cost to departments) for 9mm ammo of $93 per 1,000 rounds. If someone offers you ammo at that price, be careful. Maybe they don't know that ammo costs have jumped and you're buying it for what they paid. But it is more likely that it isn't worth anything. Second, find out where it is from. Never heard of the country, arsenal or ammo company? Bad sign. Now, if they are brand-new, you might not have heard of them, but generally, unknown is not good. Third, try some and see how it performs. A couple of boxes, closely inspected and then run over the chronograph, will tell you a lot. If the guy at the gun show (or internet page) is telling you "You better buy all you can; we may run out soon," you have your first clue it may not be such a good deal.